The Inkerman Road application is interesting since the site is zoned GRZ1 (ie supposedly 3 storeys and a 10.5 metre height limit). Since council’s schedules do not specify the number of storeys, and the land slopes, this application for a part 4 storey was deemed to be okay. We point out again that for all of council’s structure planning and quality design guidelines, the schedules largely remain intact. 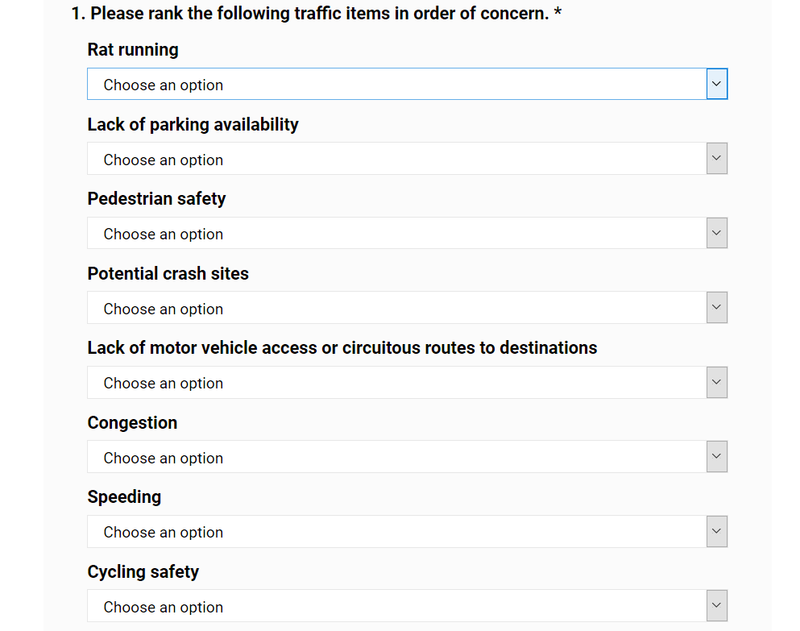 No changes to site coverage, permeability, etc. Worthy of keeping a close eye on, is the following from the minutes of the Local Law committee. This could be ‘positive’ or ‘negative’ for residents. 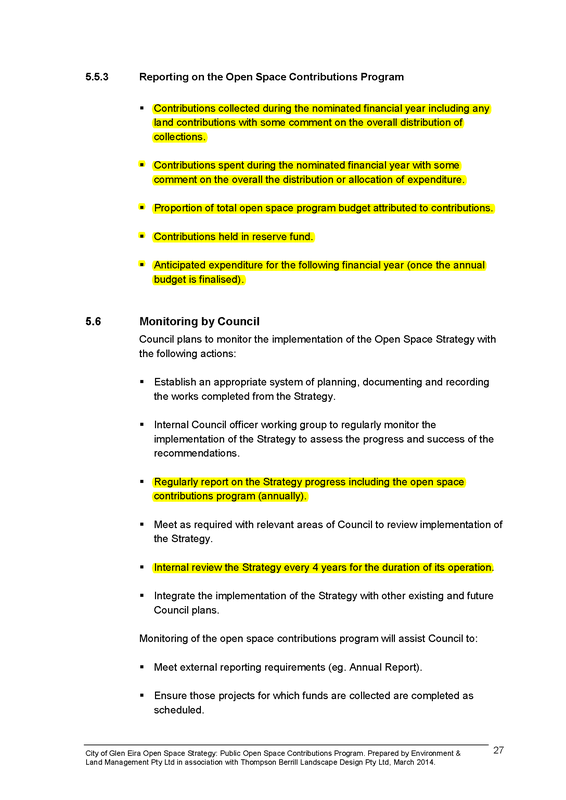 For quite a while now, council’s reporting of the open space reserve in the monthly financial report has opted to camouflage what is really happening. This can only be deliberate and is another example of the lack of transparency in Glen Eira. We are supposed to believe that the ‘kitty’ currently contains $20m. Yet, we are not privy to how much of this total has been spent on ‘development’/’upgrade’ of open space. Hence how much is really left in the open space reserve? By way of contrast and transparency, we highlight how these figures were reported previously and ask why the change? What percentage of the levy has been spent on the acquisition of new open space and what percentage has been spent on ‘development/upgrading’? What ‘land contributions’ has council accepted instead of a financial payment and where are these located? How much of the following ‘promises’ has council kept and why can’t this be disclosed to the public? Mr SOUTHWICK (Caulfield) (09:51): This morning I tabled a petition with over 1700 signatures of support calling on the Andrews government to immediately review and reduce interim height limits for the Caulfield electorate, and I note the Minister for Planning is at the table today. Minister, the inconsistent and unfair height limits established by yourself as the Minister for Planning in amendment C157 to the Glen Eira planning scheme have encouraged a wave of inappropriate high-rise development proposals in Selwyn and Horne streets, Elsternwick, on what was the Daily Planet site and also the old ABC site. We are also seeing on South Road another development of up to 12 storeys with no height restrictions whatsoever. These high-rise developments threaten to impinge upon the neighbourhood character, amenity and traffic flow, introducing overshadowing and privacy concerns for thousands of residents in my electorate. I have met with a number of residents, some of whom are in the gallery today, from Caulfield South and Elsternwick that are affected at these sites, where I have seen firsthand the effect of inappropriate overdevelopment in these areas on the community. 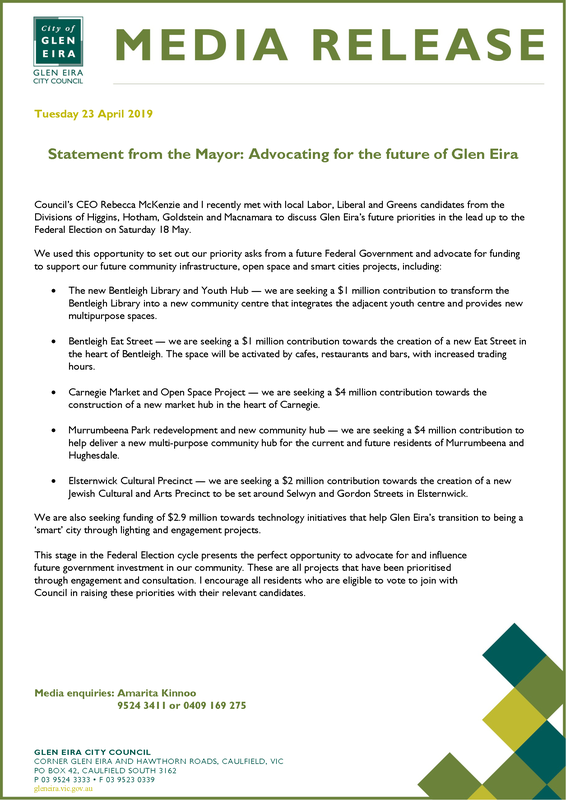 I have written on behalf of residents to the mayor of Glen Eira City Council to seek assistance in reviewing and addressing the concerns of these residents. Minister, these residents would like to meet with you to talk about these issues and to see if we can get some consistency with the Oakleigh and Bentleigh electorates which have restricted height limits of six storeys while we have discretionary height limits of 12 storeys. If it is good enough for the goose, it is good enough for the gander. We should have consistency in our planning scheme. The SPEAKER: Order! Order in the gallery, please. Mr SOUTHWICK (Caulfield) (11:47): (385) My constituency question is to the Minister for Planning. Minister, throughout the electorate of Caulfield we are seeing a number of overdevelopment proposals that are currently out of character with the local amenity and threaten residents’ way of life in the Caulfield community. In fact we tabled a petition today of that nature. Caulfield residents have seen these proposals from Horne Street, Elsternwick, the old ABC site, and of course now in Caulfield South. 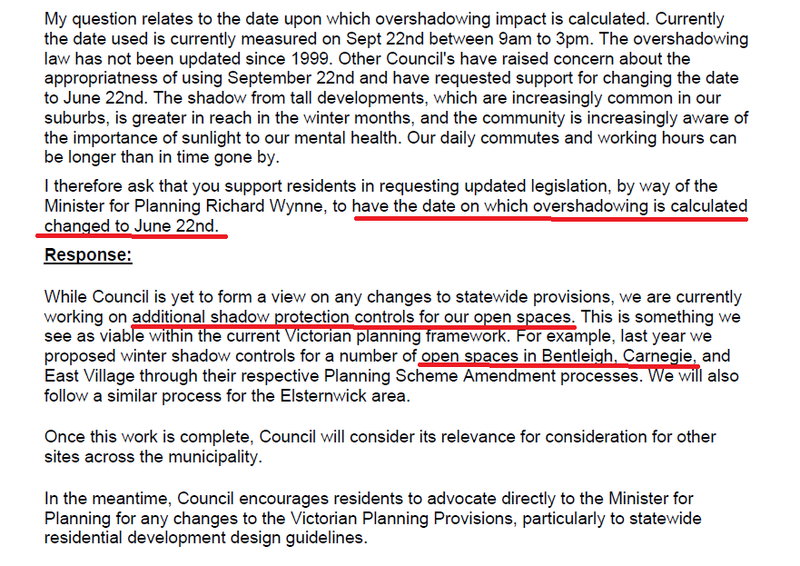 There is inconsistency when it comes to planning in the electorate of Caulfield. Of particular concern is the discrepancy in the interim height limits of Elsternwick, Bentleigh and Carnegie because of planning scheme amendment C157. Minister, we ask you why there is such an inconsistency in the planning scheme. In Glen Eira City Council on the Caulfield side there is a 12-storey discretion, and within Oakleigh and Bentleigh it is four to six storeys. Why is there that inconsistency, Minister? The interim height limits established by the Minister for Planning, The Hon Richard Wynne MP in Amendment C157, are inconsistent, and unfairly impact Elsternwick and the broader Caulfield community. The interim height limits have encouraged a wave of inappropriate high-rise development proposals in areas such as Selwyn and Horne Streets, Elsternwick and Hawthorn Road, South Caulfield, These proposed high-rise developments will impinge upon the surrounding neighbourhood character and traffic flow, introducing overshadowing and privacy concerns, without necessary community infrastructure upgrades. The discrepancies between current interim height limits lack essential strategic justification, therefore the petitioners request that the Legislative Assembly of Victoria call on the State Government to immediately reduce the interim height limits for the Caulfield Electorate. Tonight’s council meeting resembled a three ring circus and revealed once again to what extent decisions are made behind closed doors in Glen Eira. The ‘circus’ involved Item 9.1, on the 14 storey application for Horne Street, Elsternwick.. The motion was entirely unexpected by all. Hence no grounds for refusal (as required) were as yet drafted. Countless apologies to officers for this ‘surprise’ and not a word of criticism for their recommendation that went beyond the current Design & Development Overlay. Instead, we got comments as to how well they are interpreting the planning scheme. Same old arguments from Hyams and Sztrajt such as ‘we could get worse outcome at VCAT’. A 5 minute break in proceedings so councilors can again ‘decide’ what to do behind closed doors. Magee’s ‘liking’ for 12 storeys, but only if it’s in the ‘right place’. That is along Nepean Highway. On return, Delahunty’s motion was voted out. Only Delahunty and Magee voted in favour of refusal. All the rest voted against. Please note that Athanasopoulos and Esakoff were absent. Davey had foreshadowed a new motion for a permit of 8 storeys. It was then decided that the issue would come back for decision once Torres had been given some time to draft the relevant motion and its conditions. Silver moved motion for 8 storeys. Sztrajt seconded. Voted in 5 votes to 2. Interestingly, Davey who foreshadowed the 8 storey motion, voted against! Magee also voted against. Cade was silent throughout this item. Baseless claims by Magee and others that the structure plans were in line with community sentiment. All community feedback was strongly against the 8 to 12 storey heights. 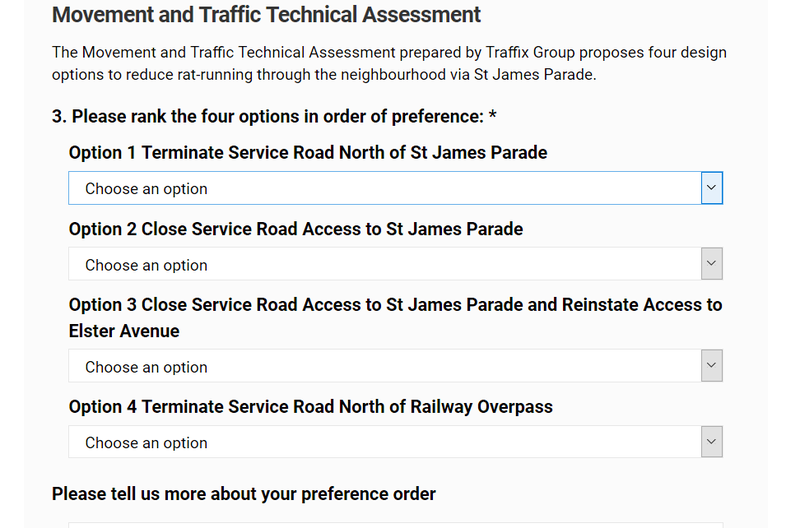 Traffic and overshadowing documents that were to be done over a year ago are still to make it into the public domain. Has council actually done this work? Why does this council continually blame the State Government and yet not one single formal public statement has been made that challenges anything. When other councils such as Boroondara, Mornington Peninsula, Stonnington can voice their disapproval of government decisions, why is our council silent and compliant? This is not advocacy. It is complicity! Please listen carefully to the incredible waffle that epitomises these councillors decision making! Finally, we also point out that in response to the 4 or 5 public questions council did not provide a single answer. SOUTHERN METROPOLITAN REGION Mr HAYES(Southern Metropolitan) (18:01):My constituency question is to the Minister for Planning. I refer the minister to the case of my constituent Graham Huntly, who is helping the government meet its renewable energy target by putting solar panels on his home at Ross Street, Elsternwick. If Woolworths succeeds in building 10 and 14-storey towers in Elsternwick, Mr Huntly’s sunlight will be blocked and his solar panel investment—to say nothing of his quality of life—will be devalued. What rules does the government have in place to stop developments overshadowing solar panels, and will the minister support Glen Eira council’s eight-storey height controls—and make them mandatory—and reject 10 and 14-storey towers in Elsternwick? Council continues on its merry way of destroying Elsternwick by recommending a 12 storey permit for Horne Street (Daily Planet site). We remind readers that this area sits alongside single and double storey dwellings, even though the latter (Ross Street) is zoned RGZ (four storeys). Council therefore sees no problems with a 12 storey building backing onto dwellings of this size. The application was for 14 storeys and true to form we get a recommendation to lop off a couple of storeys. There is much in this officer’s report that is highly questionable if not straight out farcical. In this post we will simply concentrate on the draft permit and what the recommendations allow. We quote from the report. The building height to be reduced to not more than 46.30m above natural ground level comprising not more than 12 storeys, with no architectural features,services, stairs, lift overruns or masts higher than 50.30m above natural ground level. COMMENT: Amendment C157 has as the ‘maximum building height’ 43.0 metres (discretionary). Thus, even though council might be reducing the number of storeys, the overall height of the building itself will be even greater than the structure plan suggests. Plus with masts up to 50.30 metres the building will definitely reach for the skies. The adopted C157 Amendment only allows a 4 metre extra height for masts, telecommunications, lift overruns, etc. So now we have the absolutely ludicrous situation where council first wanted 8 storeys and with ‘community benefit’ maybe 12. Now they are okaying extra height for both building and its masts, both in opposition to its own planning scheme! The owner will maintain the shared space side laneway for not less than 5 years after the date of its completion to the satisfaction of Glen Eira City Council. A Section 173 Agreement should be entered into for the permit holder to provide and maintain the shared space side laneway for the life of the building and to secure the office floor space for the life of the building. Which is it? Or is the above comment intended to camouflage what the Section 173 agreement will state? Surely the ‘life of the building’ is more than the 5 years stipulated in the conditions for the permit? Secondly, why only 5 years? Does this mean that in the 6th year the costs of maintenance will now fall upon council and hence ratepayers? The front (north-eastern) setback of the tower element (third floor and above) to Horne Street increased to a minimum of 4.0m. COMMENT: We have to ask, what’s the point of having a structure plan if it ends up being ignored. The recommended setbacks are the perfect example of this. Amendment C157 included a requirement (preferred) of a 5 metre setback. The original urban designs for our activity centres had featured a 6 metre setback but council changed this to 5 without any real explanation. Even so, how on earth is it now considered appropriate that this be even further reduced? Why bother with structure plans at all when council itself decides it can ignore what it so loudly championed? As to what constitutes ‘community benefit’ we get the rubbish of widening a laneway by a few metres as proof of this, plus the creation of ‘passing areas’ because otherwise cars won’t get through.Creation of offices is nothing more than pie in the sky at this stage as well. We have also had a good laugh at this sentence Over time, the character of Elsternwick will change as buildings, consistent with the planning controls are constructed. One must question how many of these past high rises and now this one can be seen to be ‘consistent with the planning controls’? We can only speculate as to why council would recommend a permit of this height? Our suspicion is that it is merely another nail in the coffin for low rise along Nepean Highway. Council is determined that Elsternwick becomes the high rise capitol of Glen Eira. Granting a permit for one more eyesore makes it a lot easier to have 12 storeys along all of Nepean Highway, regardless of whether this is needed or not! Well done council. At least you are consistent in your appalling planning decisions!